Spring has arrived and the final quarter of the school year is here. Whether you live in the northeast or the southwest, students and teachers know that the seasons have changed and this school year is quickly coming to a close. With each day passing there is an opportunity in front of us as educators that we cannot dismiss. It happens every year and we see it around us. Many times it happens within us. Either we raise our game and put the throttle down and finish strong or we simply take our foot off the gas and go on autopilot and coast until that final bell. Here are five ways to finish the year that is best for students and best for you. As educators we have invested countless hours in planning, delivering and embracing the opportunities of each school day. Now that the final months have arrived, here is our opportunity to deliver some of the most powerful lessons of the year. With that, consider these tips to stay dialed in. 1. Stay Focused. Seasons have changed and it is getting greener. While we hear the birds chirping and see the flowers blooming, remain focused on the lessons yet to be taught. Make sure your learning targets are clear, your lessons are rich with student engagement and you are intentional with your assessments. Measure learning NOT material. This time of year you can get more from your students than at any other point. Keep yourself focused and the impact you will make will be obvious. 2. Relationships Still Come First. You have spent 8 months building upon the relationships that come to your classroom each day. Your students are hanging on every word that you speak and believe in you now more than ever before. This is your opportunity to dive into some learning and really draw from them their passion to grow. Be intentional in your instruction and use the relationships that you have fostered to push the limits of teaching and learning. 3. Grow Yourself. Recently a conversation arose about teachers and professional development toward the end of the school year. Educators are exhausted and administrators are attempting to find balance between allowing for that space to breath while still expecting best practices and growth among their staff. The reality is this, we never stop learning. As an educator you should be pushing yourself professionally as much in April as you did in August. There is no "down time" and there is no break in learning. Model this with your students. Show them that growth happens year round. 4. Check Your Goals. Remember when you sat down created your SMART goals to start the year? This is the time to assess where you are and ensure you have put the effort into accomplishing each and every one of those. If you have not been able to complete what you intended to start, time to get busy. Goals are set for a reason and if you haven't reached them, do not abort your passion to do so, simply find a way to get to the finish line and lean on others for support and guidance. 5. Celebrate. We have worked hard. Knowing we have spent hours upon hours of preparation and delivery and now comes the reality that the year is coming to an end. The relationships you have formed have paid off in the expectations you have set of others. Whether as a classroom teacher, a building administrator or a district office leader, find balance in the push to the end while ensuring that there is celebration of the organizations accomplishments. Just like a graduation ceremony for seniors, include the pomp and circumstance for even the youngest of our students. Celebrate your efforts and the efforts of those around you. Everything we do in education begins and ends with the interactions we have with others. 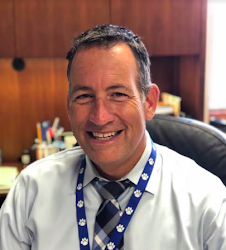 Our role is to ensure that it is those purposeful and intentional relationships that will drive the successes we experience throughout the entire school year. 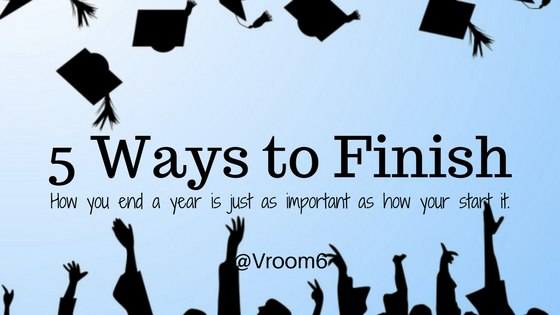 As you wrap up your academic year remember to finish strong. Avoid going on autopilot and make the most of each moment of each day. This post was first published in May of 2016. Landing that first teaching job, any teaching job, can be a daunting task. The world of teaching is as competitive as it ever has been. Whether spending hours in coursework, months of field study or after years of teaching, securing that coveted role of educator is not for the faint of heart. It will take more than talent. You will need to build skill along the way. These past three weeks I have conducted three webinars with the Lead Learning team. In addition, I have had multiple Voxer conversations with five educators seeking advice to land their first job, And, I have had four student teachers/tutors sit down in my office and we have discussed what it will take to be the last one standing when the process comes to an end. The reality is that getting hired is not easy. Separating yourself from the pack can be overwhelming. Knowing what to say, and what not to say, can be intimidating. 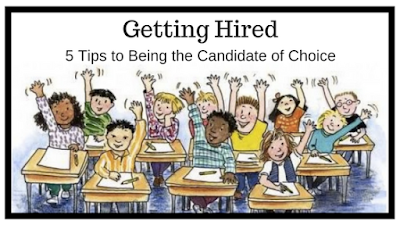 So, knowing all of that, I have compiled 5 quick tips to assist you on your way to becoming the candidate of choice and becoming the teacher you have so much passion to be. 1. Be Crisp. Whether your resume, your portfolio or your presence, present yourself in a way that you want the community of learners to see you. There is no second impression. Once you walk in that room and shake the hands around the table, that's it. That is who you are and how you will be remembered as they process their choices while you are there and well after you have left. 2. Be Confident. Getting to that interview table was hard enough. Now that you are there it is time to let the team have it. Come out strong. You are asking to be entrusted with other peoples children. Demonstrate to the team through your words and your interactions that you can handle that responsibility. Whether the students are 5 or 15, articulate through your responses that you are ready for the task at hand. 3. Have Vision. A candidate that knows exactly what they believe in when it comes to education is an impressive candidate to put it mildly. This doesn't mean that they aren't willing to learn. Just the contrary. 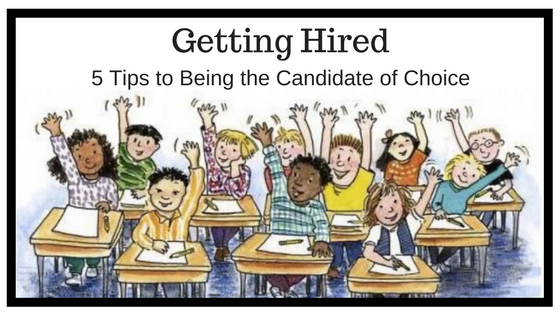 A prospective candidate that is well-versed in best practices like homework guidelines, grading practices, technology, personalization and blended learning speaks to the vision they posses for teaching and learning. You can't be faulted for having vision. Take those pictures of the Medieval Festival, throw in some screenshots of your grading rubric, assessments and exit slips, put it to some Jack Johnson upbeat song (see below) and make an iMovie. Then, during the interview when asked about "a lesson that stands out" or "an example of best practices" you have a real-life, technology driven example. That is how you separate. 5. Leave it on the Table. To conclude the interview process most conversations end with the team asking the candidate if they have any questions. If a question didn't capture a strength or you have more you can add about why you are best for the job, you have to use this time to share it out. Don't get in the car driving away and say, "Oh, I wish I would have shared _______!" This is your time to leave it all on the table. Hats off to those entering the profession. You are what we need. 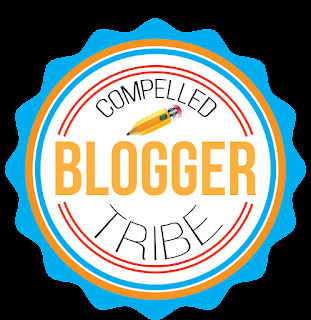 You are passionate, bright and outgoing educators that will do what is best for kids. As the ones doing the hiring (whether an individual or a team) we strive to find the best of the best. To be selected you have to separate yourself. Bring that 20% that no one else thought of before they entered the room. You will be better for it. And, hopefully get the position you seek.